Miles of trails close to the highly developed areas of Bergen and Passaic counties make these mountains a favorite destination. 102 miles of trails are maintained by 45 Trail Conference volunteers and member groups. The Ramapo Mountains - the easternmost part of the New Jersey Highlands - form a striking escarpment along the northwest border of Bergen County. Although their elevations exceed 1,000 feet in only a few locations, the gain in elevation from the Ramapo River below is quite substantial. 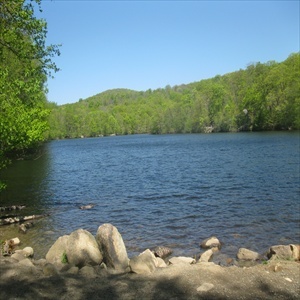 The proximity of these mountains - which are traversed by a dense network of trails - to the highly developed areas of Bergen and Passaic counties makes them a favorite destination of hikers. Most of the land in the Ramapos is now in public ownership, although divided between several state, county, and township parks.